If you can't open any file in Windows 10 due to "Your Internet security settings prevented one or more files from being opened" warning, here's how to fix. When you open a file in Windows, a security identifier stored in file properties when it is being saved, checks its integrity. If the security identifier found the file harmful, it immediately blocks and the file can’t be opened at all. Well, its a quite old story, but yet it is true today even for Windows 10. But the file we’re were trying to open wasn’t harmful and we were quite sure about it. So how to fix this and tell Windows that the file is safe to open! If you’re also having this problem, this post is for you. The root cause for this issue may be incorrectly configured Launching applications and unsafe file security setting. If you reset this setting to its default configuration, this issue gets resolved. 2. Next, in Internet Properties window, switch to Security tab. Click on the Custom level button there. 3. 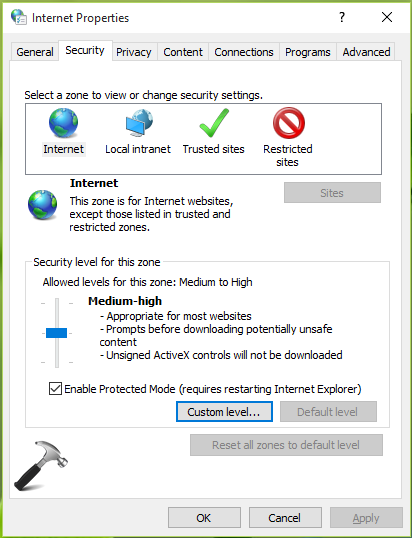 Next, in Security Settings – Internet Zone window shown below, scroll down and look for Launching applications and unsafe files setting. The setting might be set to Disable and this is the root cause of this issue. Set it to Prompt (recommended) option and click OK, Apply, OK.
4. Finally, reboot the machine and after restart, you should be able to open the file without any warning message. We hope resetting IE will fix this and other issues (if any) at once. After IE reset, reboot once and try opening same file, it should work this time. If The problem persists, create a new user profile and back up your documents to the new user profile then delete the old and the problem will be sorted. For me FIX 1 WORKS…. Thanks a LOT !!!!!!!!!!! !